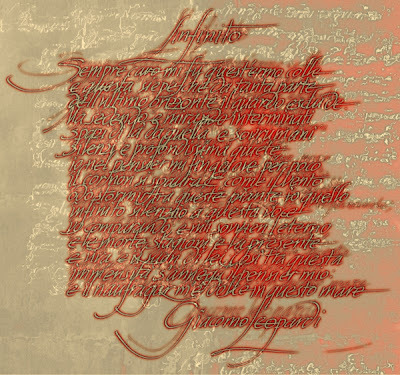 In Italian schools they used to have students memorize poems - tons of them, beginning with easy ones in elementary school, going up to long sections of the Divine Comedy by the time you were in high school. At the time, I resented having to repeatedly read and recite verse, but now that I've long forgotten most of the poems I had memorized, the few that remain have become treasured possessions. You make a good point. We often underestimate the value of what we're required to memorize (or even learn) in school. Only to think fondly of ourselves when we're older for remembering those same texts. I'm quite impressed by your ability to recollect Giacomo Leopardi's L'Infinito. For those of you who don't speak Italian, no worries, it's quite good in English too.